Introduction: In this article I am going to explain how to get checkboxlist selected item text/value as Comma separated string using 3 different ways in Asp.Net using both C# and VB Language. 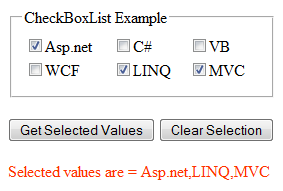 Description: While working on asp.net project it is very common requirement to show checkboxlist selected items in comma separated string. I have mentioned 3 different approaches to get comma separated values(CSV) of checkboxlist selected items. You can pick any of the three. My preferred approach is the last one i.e. Using LINQ. Implementation: Let’s create a demo page for demonstration purpose. <asp:Button ID="BtnGetSelectedValues" runat="server" Text="Get Selected Values"
<asp:Button ID="btnClearSelection" runat="server" Text="Clear Selection"
lblSelectedValues.Text = "Please select any course"
Do you have an example that let a user search a database according to which checkbox list is selected? Also using a textbox for search value.